Do you like meatballs? Do you buy them frozen at the big box stores? Yes . . . I know it’s convenient. . . . I’ll even admit to buying them myself. But making them at home and then freezing them is oh so easy . . . . the taste is much better . . . and best of all . . . there are no preservatives. We usually grind the meat ourselves. . . this time we found a good quality ground chuck so we used it in this recipe. There are only a few ingredients and mixing them up takes no time at all. There are six ingredients and what takes the most time is mincing the garlic. This recipe gives you freedom to do it your way and to your taste. 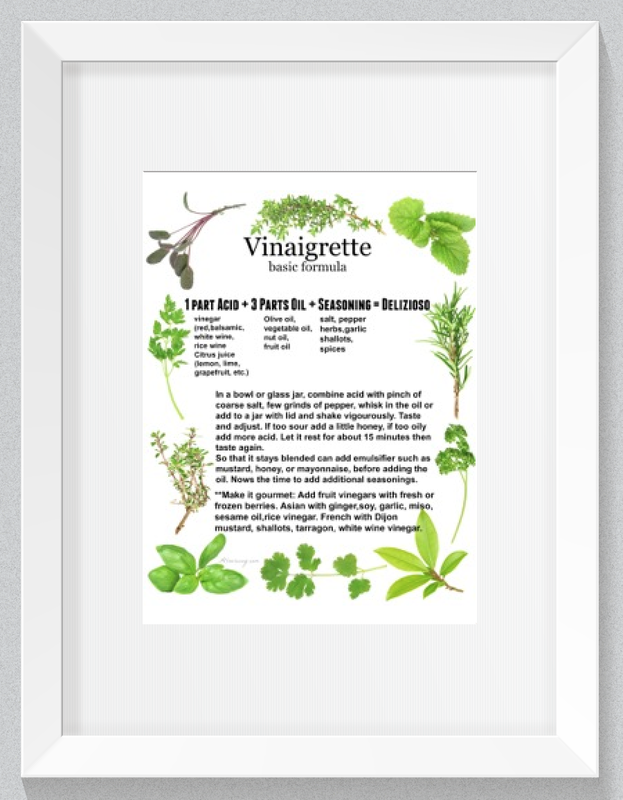 You can add as much or as little garlic as you like and you can spice it according to your preference. 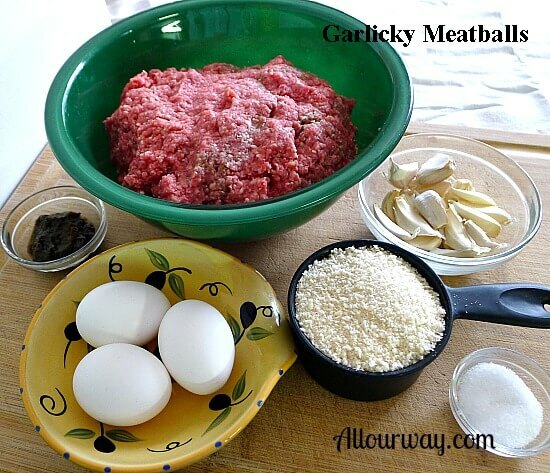 You will have to mix the meatballs by hand so that you get the ingredients evenly distributed. We use a disher (ice cream scoop) to measure out even sized meatball. Then we roll the meat in a cupped hand so that we have a compact ball. Roll Meatball in Cupped Hand. 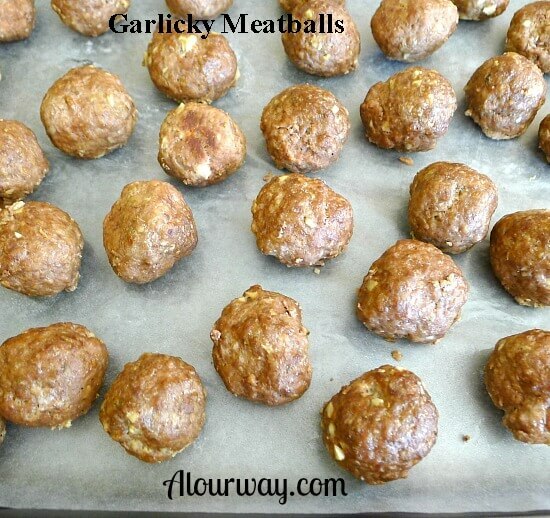 The meatballs are placed on a parchment lined baking sheet or on a baking rack inside of a baking sheet. The latter method is better because the fat is drained off of the meatballs. Bake the meatballs in a 350F preheated oven. Once they’re finished baking transfer them onto a paper towel lined tray. After they’ve completely cooled put then on a wax paper lined baking sheet that has been lightly sprayed with oil and freeze. Store them in a container in the freezer and take out as needed. 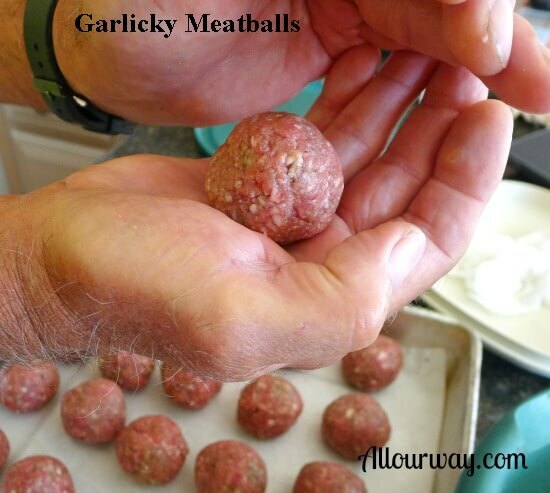 These meatballs are spicy and garlicky. They are easy to make and freeze so that you always have some on hand. Combine all of the ingredients in a large bowl. With your hands gently mix until just combined. Use a disher to scoop an even amount of meat mixture. Shape the meat in a cupped hand to get a nice smooth ball. Moisten your hands with water if the meat seems to stick. Place meatballs on a parchment lined baking sheet or on a cooling rack placed inside the baking sheet. Bake in preheated 350F oven for 35 to 40 minutes. Remove from the baking sheet and let cool on a paper towel lined tray. Once cool place the meatballs on lightly oiled wax paper. Freeze. Once frozen store in a freezer container or freezer bag. 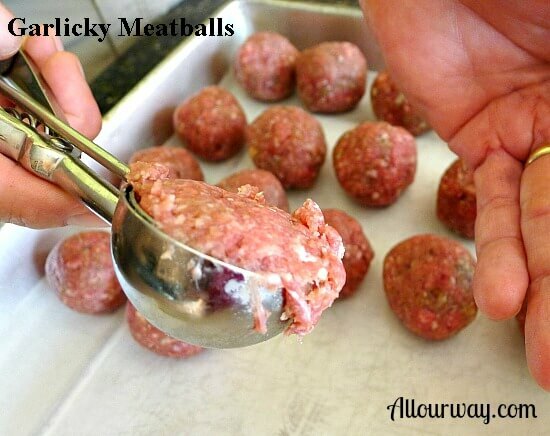 Thaw out the amount of meatballs you want to eat and use in whatever recipe you like. The recipe is our way -- we like spicy food. We made the meatballs using a 1 1/2 inch disher which is a good sized meatball. If you make your's smaller -- adjust the oven time. It may seem redundant to spray wax paper with vegetable oil but we have had things stick to the wax paper when we try to remove the frozen item. Better safe than sorry. You should take part in a contest for one off the highest quality sites online. Thank you very much for stopping by and your kind words. We love sharing our recipes and we always welcome anyone interested in cooking and things Italian.